After months of preparation and anticipation, the installation of the Trinity Dome mosaic is rapidly underway. Above is the very first section of mosaic being placed in the pendentive that features the evangelist St. Luke. Artisans commence the monumental task of this massive installation by locating the first piece. This proved quite straightforward, given that the Travisanutto Giovanni Studio had painstakingly organized and packed each and every one of the 30,000 sections of the Trinity Dome mosaic. Once the artisans retrieved the first segments of the mosaic planned for installation, they worked to find their appropriate home on the 18,300 square feet of the dome surface. The process was simplified as the wall of the pendentive had previously prepared. Since the original gypsum plaster was too flimsy to hold the weighty Trinity Dome mosaic, it was stripped off the dome’s surface and replaced by Portland cement plaster. Since Portland cement plaster is smoother than the material before it, it was possible to draw a detailed reflection of the mapping of the final Trinity Dome design. Additionally, the mosaic was created using the Indirect Method, meaning that it was produced in reverse with the tesserae individually affixed by artisans’ hands on sections of paper. When artisans adhere the mosaic to the surface of the dome, the paper side faces outward while the tesserae faces inward. This further streamlines the process, because the paper side of the mosaic provides precise mapping. 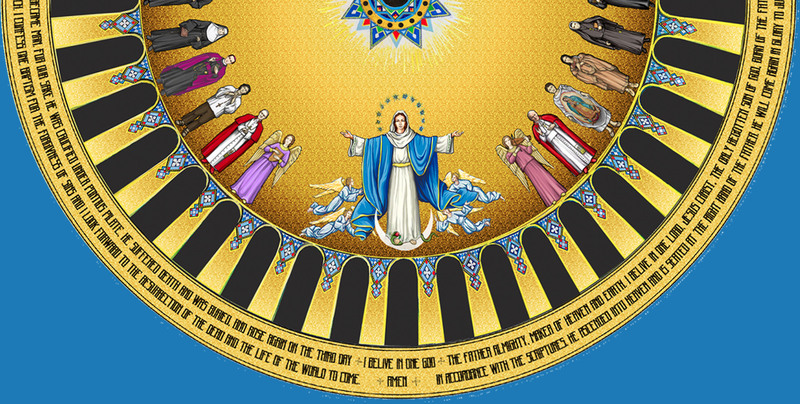 Before the full-sized sketches of the Trinity Dome images were divided into smaller pieces and tiled, circles of different shapes and sizes were drawn all over the back of the sketches. Then, numbers were pre-drawn on the center of sections before they were separated. Thus, when piecing them together on the wall, artisans match the lines of the circles, and ensure that the numbers are close to each other in numerical order. With these mapping aids, artisans placed the first piece of the Trinity Dome mosaic, affixing it to the wall using a thick layer of wet cement. This process continued with successive consecutive pieces, stopping once the entire numerical section had been tamped onto the cemented wall. The artisans then used hot water, soft brushes and sponges to gently dissolve the paper and the flour paste which adheres it, to reveal the first section of the mosaic—the pendentive featuring the evangelist St. Luke. Over the coming weeks, artisans will precisely and methodically install the mosaic sections of the Trinity Dome. It is undeniable that this undertaking, one of the largest mosaic installations of its kind in the world, is a magnificent feat of art, architecture and engineering, and the fruit of much labor.